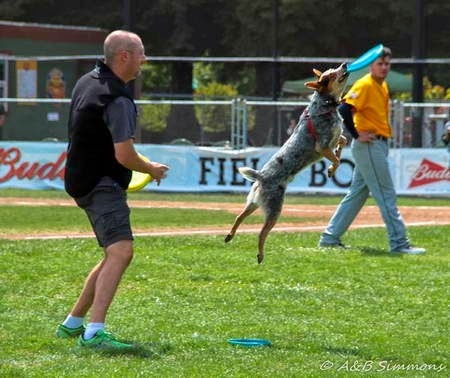 A few weeks ago we had a Disc Dogs of the Golden Gate event that we took part in, where Vader participated in the OPEN and PRO divisions with myself and Amy. And considering how much we do with him on a daily basis, this was a quiet day. 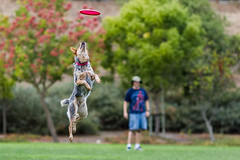 The next day we took part in a "Frisbee Dog" demonstration out in San Rafael at a minor league baseball game and that was fun. 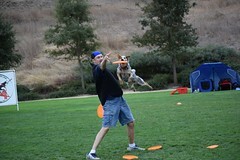 Vader and I had one of our best freestyle rounds ever. And to be honest, to hear the stands full of people go "Ohhh!" during one of Vader's infamous high flying catches was quite the rush. Again, we kept it somewhat sedate and as days go, we didn't quite do as much with him as we might on a regular day at home. 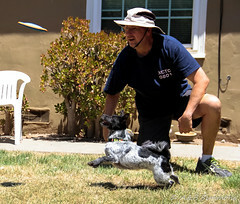 Then that night right after dinner, (July 13), Vader starting limping pretty badly and holding up his leg when standing still and that changed our routine instantly. We went from practice and play 2 to 4x a day to no disc or ball play for a week. 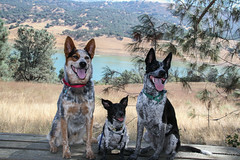 Yes, a herding breed being kept sedate... it's not a pretty sight and can be a scary experience for the humans too. I became his night time chew toy. But after a few days of caution, we couldn't bear it for too long, and rather than self-prescribe our treatment, we went to the Vet (Adobe Animal Hospital) to have him checked out and get x-rays. No breaks were noted in the x-ray and it was determined/guessed to be soft tissue damage, much like a pulled muscle or a mild form of tennis elbow. And if anyone has had this kind of injury, you know they are pesky and take forever to heal from. We've had Vader on doggy ibuprofen since our vet visit and things seem to have some along nicely. We had to pull out of one demonstration over in Niles, and that was very hard to do because I hate backing out of something I've said we'll do. But we went and helped with set up and running the demo for everyone else. And it drove both Vader and myself crazy not being able to go play. 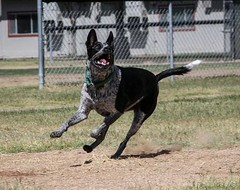 But today, (July 31), Vader seems more energetic and willing to play and jump. (Looking back, he too was seemingly taking it easier than normal.) 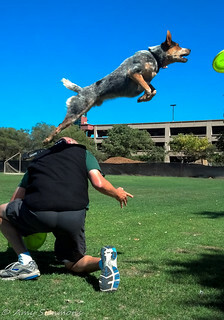 We started rolling tennis balls for him this week and have been tossing skimmers at him. 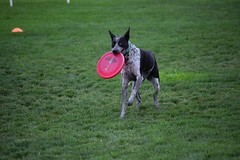 Skimmers is my term for when we toss the disc and it sails about 3 to 12 inches just over his head so there's no real jumping involved in catching it. And all seems fine. When he lies down for a period of time, he seems to have a subtle limp when he gets up, but it goes away within a few steps. So we think he is doing pretty good. 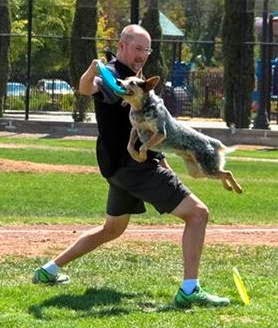 Good enough to participate in the upcoming Disc Dogs of the Golden Gate 3rd 2014 competition. (<- link goes to FB page) on Sunday, August 3rd. 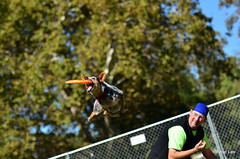 But we're playing it a little safe and and only performing in the Pro division Toss and Catch contest. No freestyle this time around. We think he's fine, but by the end of Sunday, we'll know for sure.